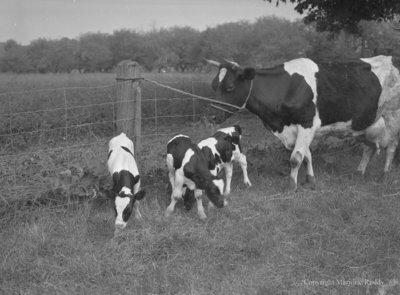 A black and white large format negative of the O'Connor's Holsteins. View is of a female Holstein and her triplet calves. The O'Connor farm was located on Lot 1, Concession 3 in Ajax, Ontario. O'Connor Holsteins, June 16, 1953, Marjorie Ruddy. Whitby Archives A2013_040_295.